Now that your Halloween costume was chosen, now that you’ve already decided on the wining creepy makeup look, it’s the right time for you ladies to start discussing about the updo you are going to use to complete your holiday look with! Join us to discover three of the most popular Halloween hairstyles and to learn how to make them on your own while playing this super fun hairstyling game for girls. 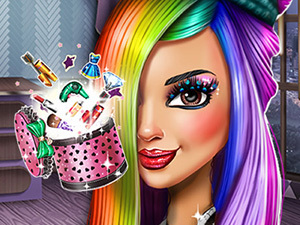 First of all, follow a few, step-by-step instructions to wash you gorgeous hair locks, use the professional hairdryer to obtain a natural volume for it too and once you have everything prepared for the fun styling part, go to the next page of the game and pick out the one that best fits your costume. A gorgeous spider web updo, the braided spider bun and the cute knotted ponytail are your options ladies, so just check them out and pick up your favorite. Follow the special instruction to make the chosen hairstyle, dye your hair in a bold colour and then look for some spooky hair accessories to complete your final Halloween look. Have a great time playing the ‘Halloween Hairstyles’ game!